As you can see Thieves Household Cleaner is very affordable! Shhh don’t tell the company, but I bought my bottle a good year ago and I still haven’t used it all up! It’s concentrated, so it lasts a very long time. A lot of times, skeptics (I’m one of the worst ones actually) think I’m just trying to sell them something that they don’t really need. After all, you’ve been using the same chemical cleaners for years and no issues, right? Wrong. Take a look at this recent article that shows the long-term effects of using toxic chemical cleaners. Regular use of cleaning sprays can have as much of an impact on health as smoking a pack of cigarettes a day, according to a new study. They found that lung function decline in women who regularly used the products, such as those who worked as cleaners, was equivalent over the period to those with a 20-cigarette daily smoking habit. “While the short-term effects of cleaning chemicals on asthma are becoming increasingly well documented, we lack knowledge of the long-term impact,” said Dr. Cecile Svanes, a professor at the University of Bergen in Norway and senior author of the study. “We feared that such chemicals, by steadily causing a little damage to the airways day after day, year after year, might accelerate the rate of lung function decline that occurs with age,” Svanes said. The scientists advised avoiding the products, and instead using microfiber cloths and water. For the study, experts measured lung function by testing the amount of air those who took part in the study were able to forcefully breathe out. They then examined the results alongside a questionnaire in which participants had been asked about the frequency of their use of cleaning products. According to the study, women who used the cleaning products regularly had a markedly decreased lung capacity. They also found increased rates of asthma among women who used the products regularly. The products seemed to affect the lung capacity of women who took part in the study more than men, though the scientists noted the number of male participants was small compared with the number of female participants. “When you think of inhaling small particles from cleaning agents that are meant for cleaning the floor and not your lungs, maybe it is not so surprising after all,” said lead study author Øistein Svanes, a doctoral student. The experts attribute the decline in lung function to the damage that cleaning agents cause to the mucous membranes lining the airways, resulting over time in persistent changes. However, one company claims to have developed a spray that kills grime and lowers air pollution, Newsweek reported in 2014. Pureti claims its spray can transform any surface into a self-cleaning dynamo that kills grime and eats up pollutants. 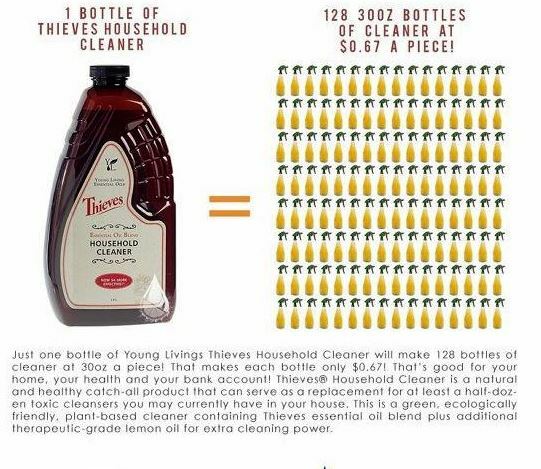 So you see how important it is to use an all natural plant-based cleaner that is not toxic? The important thing is, is to get started by replacing your toxic cleaning supplies with Thieves. If you want to cover more of your life besides just cleaning, I’d highly suggest the Thieves Premium Starter Kit. I’ve used most of these products and can tell you, I enjoy them, and they have served myself and my family well. Credits of videos above: Young Living Essential oils on Youtube and KELSEY on Youtube. There is a whole line of Thieves products and a great offer to buy all the Thieves products in a bundle and save even more! Go here to see the offer and to order: https://www.youngliving.com/en_US/products/premium-starter-kit-with-thieves You are going to LOVE the Thieves products!! When ordering online or by phone remember to put in Member # 1085586 if you are not currently a customer or distributor. This entry was posted in Essential OIls, Living A Clean Life, toxic and tagged plant based household cleaners, Thieves Household cleaner, toxic cleaners, toxic household cleaners. Bookmark the permalink.